This entry was posted on Saturday, June 12th, 2010 at 7:05 pm and is filed under plants, trees, various critters. You can follow any responses to this entry through the RSS 2.0 feed. You can leave a response, or trackback from your own site. Interesting behavior. Is it the queen that brings them back, I wonder? 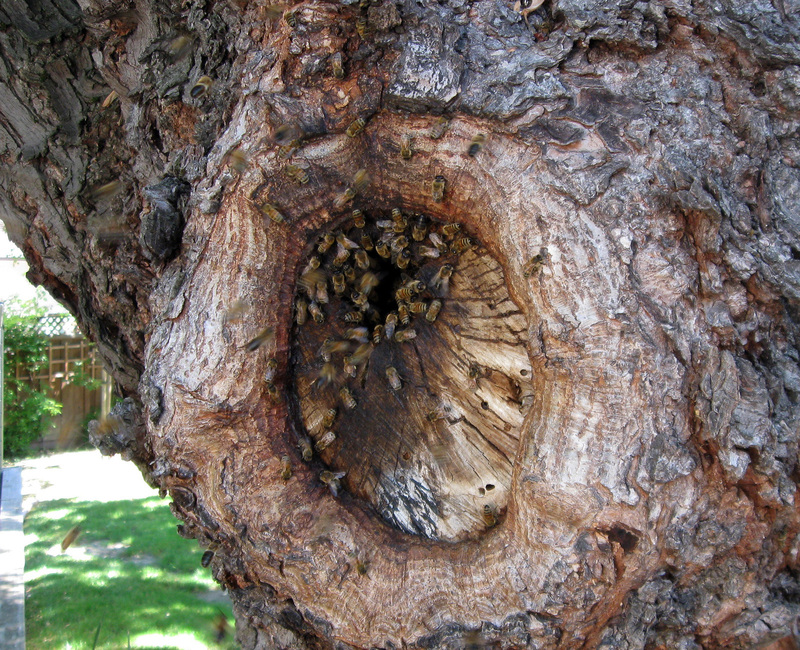 I had pigmy nuthatches in the protective cavity in a knot in my tree – you have bees. I wonder what else might live in such a place? That’s cool you had a nuthatch. Our last job had a nuthatch living in a box right over one of the areas we were planting. It flew around and scolded us the whole time. I wish I knew more about bee migration. A lot of the information I’ve seen deals more with swarming to find a new hive and doesn’t talk much about seasonal migration. It’s recognized that they will migrate, but I don’t know if it’s the queen or the scouts that remember the location and guide the swarm back each year. We had a Eucalyptus tree that served as home to a bee colony, but when the bees left, we thought they were gone for good. We removed the tree in their absence (b/c it was old, and we live in an area with periodic high winds, so were afraid it might blow down – also, we plan to add-on in the area where the tree was), and we were surprised when the bees later returned. We felt terrible as we watched them swarm around the old tree location for about 1/2 an hour, looking for their home. And as a biologist, I felt stupid for not knowing that they would return annually! Poor bees – hopefully they found another good home. Like your other posters, I was curious about which bee it was that brought the group back, and how it all worked. Perhaps the bees are ther in the winter, but just less active. 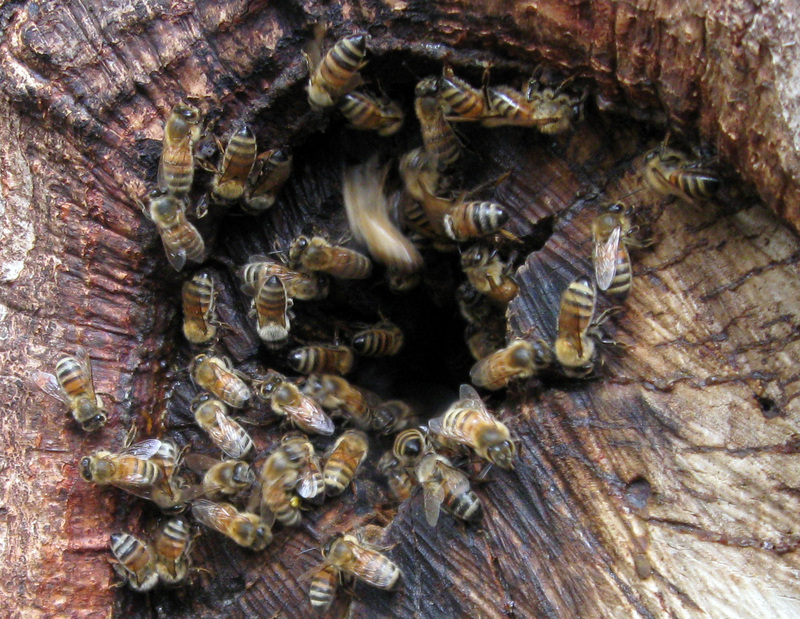 European honeybees tend to hunker down in the winter. We recently started keeping bees in Oakland, but haven’t gone through a winter, yet. 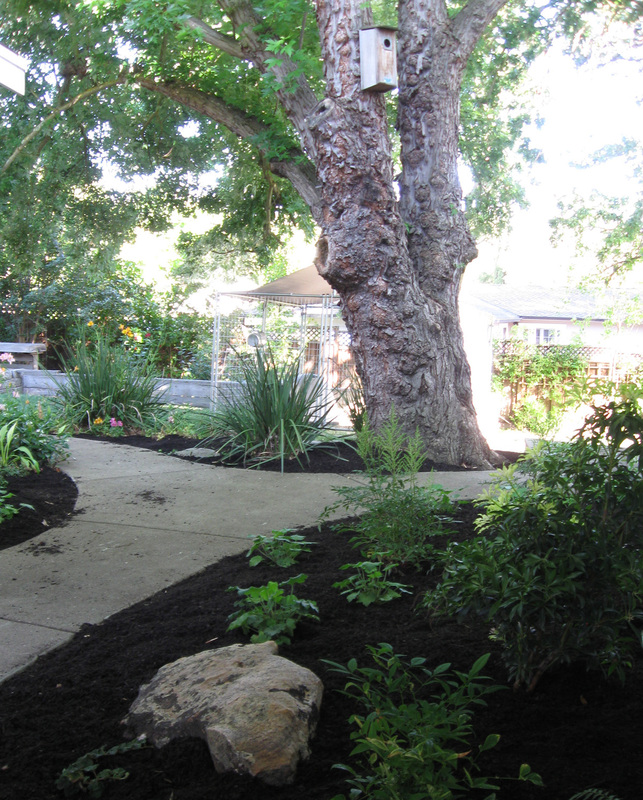 Meighan — It’s hard to argue with a decision to remove an old Eucalyptus, but that’s too bad about the bees. They probably found another home. Lisa — Our client says the bees are so noisy when they return that everyone hears them coming before they even show up and so they’re able to watch the swarm return to the tree. It seems to be site and hive specific whether the bees over-winter or migrate. A beekeeper said that it’s mostly Africanized bees that migrate, and that it might be a new swarm each year finding the hive site, spending the summer there, and then slowly petering out to be replaced by a new swarm each year. Hmmm…. I wonder…. Perhaps the tree us a great summer location, but not great for winter. Perhaps a new colony moves in each spring, attracted by the scent of the honey and wax. As far as I know, bees don’t migrate. Maybe. I’m definitely not a bee expert. My client and also commenter Meighan both think the bees migrate. Her comment that the swarm returned to the site of a removed tree seems to indicate that the swarm had some sort of memory of the former hive. But I don’t really know.